Get back Grant Circle, get on with yourself SW Petworth Lemonade Social, here comes the new Sherman Circle Social. This is awesome. What started with an idea by local resident Rob Mandle back in the fall to get Grant Circle area neighbors together to meet and casually socialize has spread around Petworth. Russ Breckenridge started the Lemonade Social at Quincy & Kansas (it's tomorrow, btw) and now Pam Brown has launched the Sherman Circle Social. 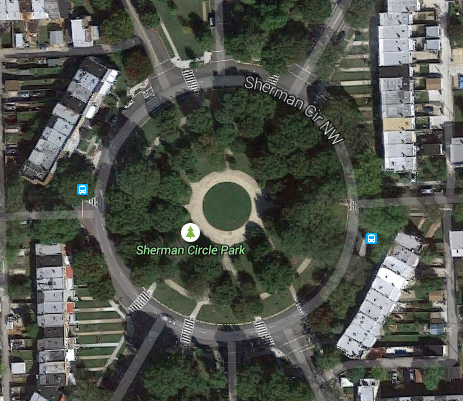 "To encourage more neighbors and new Petworth Parents to come and meet at the first Sherman Circle Social on July 1st, Bellyitch is sponsoring a giveaway for Petworth Parents. Entering is easy and you can enter as many times, on as many social media platforms, to increase your chances of winning. Entries are open from now until Friday, June 26th. A winner will be announced on Monday, June 29th. You must be in attendance at the social to claim your prize. Prizes include grocery tote by Geek Details, Sophie La Girafe and Sophie La Girafe baby products, Skip Hop first toy, NewBeauty.com beauty tube, Smarty Pants Prenatal Vitamins, and more. To enter just follow the instructions below. 2. Respond to one of Bellyitch's post with the hashtag #PetworthParents"
Good luck -- and see you at the Sherman Circle Social on July 1st!